CC BEC Pro (Battery Eliminator Circuit) is a small device that eliminates the need for a receiver battery. It draws voltage from the motor batteries and drops it to a voltage level that is suitable for your receiver and servos. This is required in applications which use high-power servos, where the ESC does not have an internal BEC, or the existing BEC is inadequate. 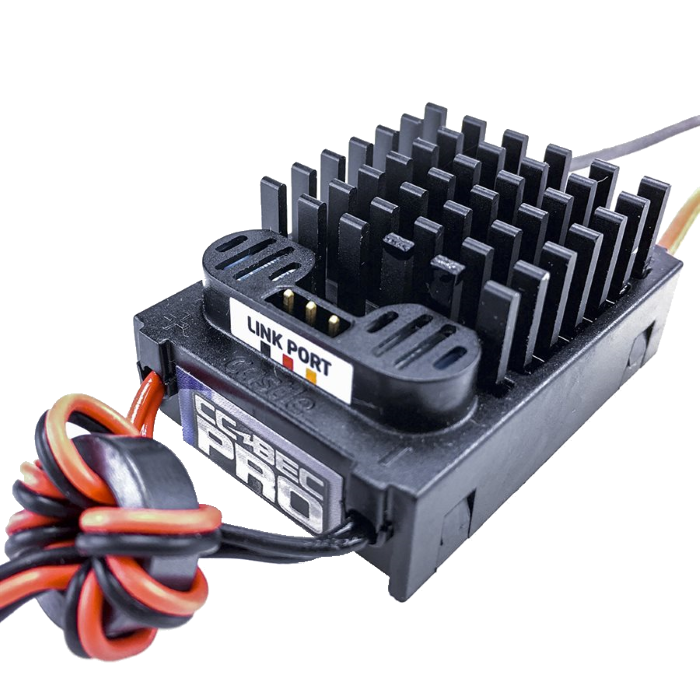 The CC BEC Pro is designed to operate at up to 12S LiPo (50.4V) with a 20A* peak servo load. Generally used for 1/5 scale cars or cars utilizing multiple high powered digital servos, lights, winches and other accessories. It is also useful in larger airplanes using 4 or more digital servos. Perfect for 500 size or larger helis. Product Use Statements: Read all wiring diagrams and usage advisories before using CC BEC Pro; PDF versions of the included manuals can be found on our support site. Not intended for use in wet conditions, BEC is not waterproof. Application Guidelines: Generally used for 1/5 scale cars or cars utilizing multiple high powered digital servos, lights, winches and other accessories. It is also useful in larger airplanes using 4 or more digital servos. Perfect for 500 size or larger helis and UAS.